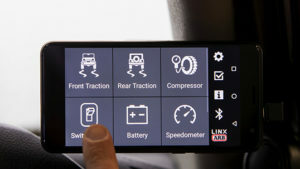 LINX is a unique modern controller that declutters the dashboard and centralises the command of vehicle accessories by replacing classic switches, gauges and monitors with one sleek and smart driver interface. Built on an expandable platform, LINX will continue to evolve your on and off road driving experience both now and into the future. Fitting out a modern 4×4 with a range of accessories such as driving lights, Air Lockers, dual batteries and air compressors can quickly lead to a dash full of out of place, hard to reach switches and a myriad of gauges and monitors either stuck to the windscreen or drilled into the dashboard – not to mention all the associated fuses and wiring. 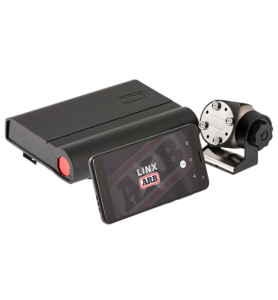 LINX offers a single point of control control via its user-friendly, Bluetooth enabled, mobile touch screen display. The LINX mobile display mounts conveniently and unobtrusively within reach of the driver while the main control hub lies neatly out of sight under the dash or seat; taking care of all accessory wiring.